Creedence Clearwater Revival released their second LP “Bayou Country” on January. 5th, 1969. The record was the first of three albums CCR would release in 1969. In an early review, Rolling Stone thought that the album suffered from a major fault of inconsistency. “The good cuts are very good; but the bad ones just don’t make it,” it said. The review was positive on the title track “Born On The Bayou” ..with John Fogerty/Creedence Clearwater Revival, Tom Fogerty and Stu Cook ,Doug Clifford. 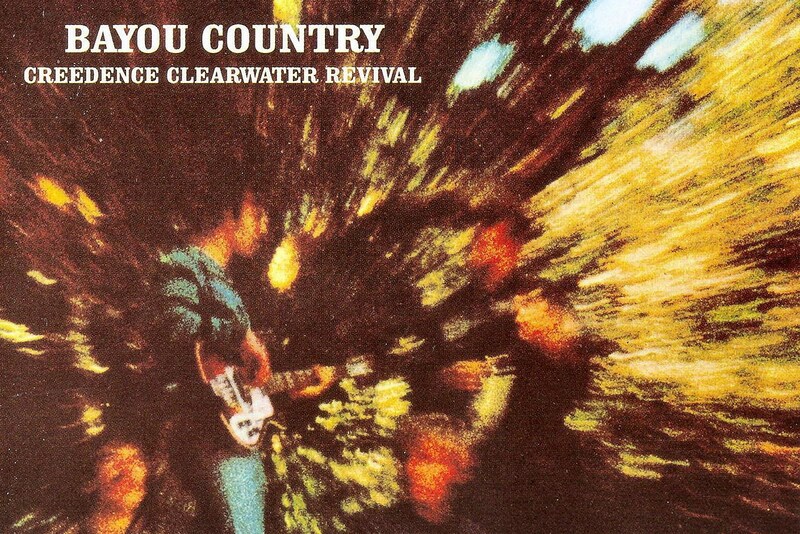 Bayou Country wasn’t Creedence Clearwater Revival’s biggest album. Green River, released a few months later, became their first chart-topping record.) Bayou Country didn’t produce the most hit singles. (That was 1970’s Cosmo’s Factory, with three straight Top 5 songs. Yet, this sophomore LP is perhaps CCR’s most important, if only because it represents the moment where John Fogerty found his own voice. And in the most unlikely of places: the American South, far away from his California roots. This fascination stretched back to his earliest musical memories, and helped push “Proud Mary” – Fogerty’s first important song – to a best-ever No. 2 spot on the singles chart. The album opened with the delightfully swampy “Born on the Bayou,” traveled darkly by “Graveyard Train” paused for an amped-up cover of “Good Golly Miss Molly” (which Little Richard recorded in New Orleans) and concluded with the chicken-fried expanses of “Keep on Chooglin’.” Creedence Clearwater Revival surrounded Fogerty’s craggly yowl with a sharp combination of R&B, country and rockabilly courtesy of the late rhythm guitarist Tom Fogerty, bassist Stu Cook and drummer Doug Clifford. He never looked at it as appropriation, but rather as a cradle for his imagination. In fact, the first single Fogerty remembers hearing was a rootsy double-sided 45 given to him by his mother – “Oh! Susanna” and “Camptown Races,” written by Stephen Foster. Later, he “was fascinated to learn that even though he wrote all these songs about the South, Stephen Foster was from Pittsburgh!” Fogerty wrote in Bad Moon Rising. So, why couldn’t he? Just six months after their self-titled debut, Creedence Clearwater Revival seemed like an overnight sensation. But they had actually spent a decade polishing and shaping this sound under earlier band names like the Blue Velvets and the Golliwogs. Something had finally clicked, and songs started pouring out of Fogerty at such a furious pace that they were suddenly having arguments over which one should appear on CCR’s A-sides. The song’s sense of nostalgic abandon also provided a welcome distraction in a war-torn world. Written after Fogerty earned an honorable discharge from the Army, “Proud Mary” was a tone-setting moment for Bayou Country, and the first in a non-consecutive string of five CCR tracks that stopped just short of the No. 1 spot. Everything started moving very fast for Creedence Clearwater Revival, as they released two more albums by the end of 1969. One minute they were crowding into a Volkswagen bus for their shows; the next CCR were swooping in on a Lear jet. Funky bars had become huge venues and then Woodstock. This transformation didn’t suit everyone. At the same time, Fogerty had now assumed a central role in every part of their output, and that was already fostering stubborn divisions. Perhaps unsurprisingly, Creedence Clearwater Revival soon began to break apart under the sudden stress.